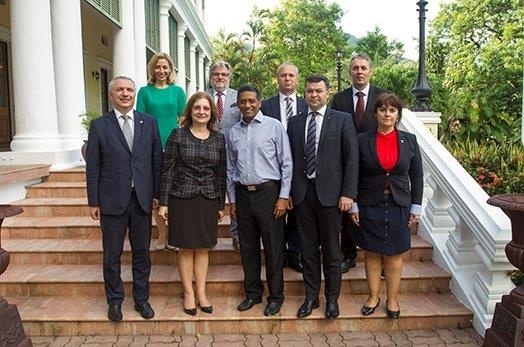 The President of the Republic, Mr Danny Faure, welcomed a Romanian delegation led by Ambassador Daniela Gîtman, Ambassador-at-large, Special Representative for UN Affairs, and Special Envoy of the President of Romania at State House this afternoon. The President welcomed the delegation to Seychelles and thanked Ambassador Gîtman for taking the time to come to Seychelles to explore ways to strengthen bilateral relations. “As a Small Island Developing State we are happy to receive you and your delegation and honoured that despite our size as a nation you are willing to enhance cooperation with us for the mutual benefit of our peoples. Your visit today represents the renewed commitment of our countries to further strengthen our partnership and elevate our cooperation to new heights,” said President Faure. Topics discussed included cooperation in areas such as agriculture, technological innovations, health and the blue economy. Speaking to the Press after the meeting, Ambassador Gîtman reaffirmed her government’s commitment to ensure cooperation in areas discussed materialise, as part of the efforts to strengthen cooperation between Seychelles and Romania. She described the meeting with President Faure as very positive. She was accompanied on her visit to State House by the Vice-chairman of the Chamber of Deputies, Prof. Univ. Dr Marilen Gabriel Pirtea, officials of the Romanian Ministry of Foreign Affairs and members of the National Council of Rectors in Romania.